[Updated at 3:36 p.m. ET] This is the strongest earthquake in Guatemala since 1976, but the damages don’t appear to be as bad as those sustained back then, Guatemalan President Otto Perez Molina said. Perez Molina said five aftershocks have happened since the first quake, which happened at about 10:35 a.m. local time (11:35 a.m. ET). [Updated at 3:32 p.m. ET] Another quake - this time with a magnitude of 5 - happened at about 1:55 p.m. local time (2:55 p.m. ET), more than three hours after and 17 kilometers south-southwest from the first one, according to the U.S. Geological Survey. The first quake had a depth of 25.8 miles. The second had a depth of 21.8 miles, according to the USGS. [Updated at 3:11 p.m. ET] Three people were confirmed dead after an earthquake in Guatemala Wednesday, but the number could rise, Guatemalan President Otto Perez Molina said. Unconfirmed preliminary reports indicate up to 15 people were killed, 15 more were trapped and 100 people are missing after the quake, he said. [Updated at 2:47 p.m. ET] Guatemalan President Otto Perez Molina said about 125,000 people were without power in Guatemala because of the quake. The president said he had heard reports of some deaths, but declined to confirm any fatalities until his government collects more information. [Updated at 12:15 p.m. ET] The quake was felt throughout Central America and as far north as Mexico City. There are no immediate reports of damage or injuries. [Updated at 12:05 p.m. ET] Latest information from the USGS regrades the quake as having a magnitude of 7.4 and locates it 15 miles south of Champerico, Guatemala. [Updated at 12:02 p.m. ET] There's no tsunami threat to the Pacific region from this quake, according to the Pacific Tsunami Warning Center’s latest bulletin. [Posted at 11:50 a.m. 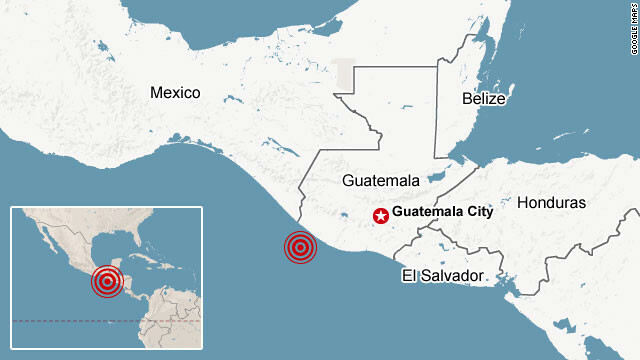 ET] A 7.5-magnitude earthquake has struck off the coast of Guatemala, the U.S. Geological Survey reports. The tremor was recorded at a depth of 20.5 miles, some 28 miles southwest of Champerico, close to the border with Mexico. Are you there? Share your photos with CNN iReport. I'm in Guatemala City, about a 100 miles from the quake epicenter and it felt VERY strong. It seems the southwestern part of the country was more affected. I was waiting to see when this was going to be blamed on Obama or gays. thankfully there is no tsunami threat. So God is punishing America by having an earthquack in Guatemala? Obviously God has decided to punish Mexico for America's re-election of President Obama. The Lord works in mysterious ways, you know. It's not our world , we have not even taken care of it. God rules......Repent and turn to Jesus . Is that the same guy that allows countless people to die by one psychopath?? I am in Belize City and I felt it. It lasted for several seconds. Bigger one coming soon on December 21, 2012. Actually.. I heard it will be a supervolcano.... but what do I know. could be... all I know is "the best is yet to come." Earthquakes happen every single day. Very true. They should report every earthquake that happens..
Any injuries or damamge in Guat City? Check the update at 12:15pm. We felt it strong here in Aguacatan, Huehuetenango, Guatemala... Not feeling aftershakes, but my heart is still pounding! Actually there were two earthquakes, one of 7.4 located in the border of Guatemala and the mexican state of Chiapas, and the other of 6.3 located in the mexican state of Oaxaca, they were almost simultaneous. Nora, I have heard nothing else about that, but it would make perfect sense according to how strong we felt it here...we're about 77 miles from that border... Where can I find out more info on that? No that was just the stock market crashing. Dramatic much? It's not the first time the Dow has dropped. It'll be okay. It was the strongest earthquake i have exoerienced. I'm in Antigua, Guatemala, less than 100 miles from epicenter and it went on for minutes. The ground was crawling under us and the walls were visibly moving. I was at the 1989 SF 7.1 and this was wild. Thank you Miguel. Hope all is well your way. I hope you're ok, Miguel. I have family in the city and hope they are doing well too! Thanks for keeping us informed. It lasted minutes there? I felt like someone was trying to pick my bed up here!